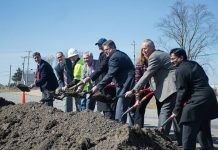 Automotive supplier Fukai Toyotetsu Indiana Corporation (FTIC) says it plans to invest $56.9 million to double the company’s Jamestown operations, creating as many as 103 new jobs by 2020. The project, which will double the current 125,000 sq. ft. facility at 1100 N. Lebanon St. to 250,000 sq. ft., will house one new blank/progressive press and two transfer presses, will allow the company to nearly double production of stamping and welding body structural automotive parts for Subaru of Indiana Automotive, Inc (SIA). Founded in 2014, FTIC is a tier 1 supplier of steel frames, mainly to SIA in Lafayette. Fukai is a private family-owned company based in Tochigi Prefecture, Indiana’s sister state, and employs 500 associates. Toyotetsu is part of the Toyota Group based in Aichi Prefecture and employs more than 10,000 associates in Japan and throughout the world. The Indiana Economic Development Corporation (IEDC) offered FTIC up to $900,000 in conditional tax credits and up to $200,000 in training grants based on the company’s job creation plans. These incentives are performance based, meaning until Hoosiers are hired, the company is not eligible to claim incentives. Jamestown and Boone County will consider additional incentives at the request of the Boone County Economic Development Corporation. FTIC is one of more than 260 Japanese establishments in Indiana that together employ more than 53,000 Hoosiers. Among all U.S. states, Indiana has the largest amount of Japanese investment per capita. With more the than one million cars assembled in Indiana each year, the Hoosier state is home to the second-largest automotive industry in the nation.